As for this album, I don't find it to be quite as strong as the second volume in this set, Dancin' on the Backstreets. That's not to say that there isn't some killer hard rock on this album; there certainly is. The classic Blue Tears sound is very much alive on this album, but not all of the tracks jump on me like they do on the debut, or Dancin' in the Backstreets. That's probably because this album contains more laid back cuts, as opposed to the up tempo, energy charged rock that they do best, at least to my ears. Seven of the sixteen tracks on this album are ballads, which is a bit of a heavy tilt for my tastes. Of the slower songs, many of these are very personal songs penned by lead vocalist Gregg Fulkerson. The Bon Jovi-ish Kisses in the Dark is the best of the bunch on the album as far as slower songs go. Misty Blue also gets my nod as one of the better slow cuts of the album, with some tasteful shreds and a killer solo balancing out the balladesque music at hand. As for the others, they are well written and delivered with passion, and so they are pretty good for what they are. I would liken those tracks to material that you'd find on a personal, introspective solo album. The material is more focused on the lyrics, and not big choruses, loud guitars, or high energy. As I've said before, energetic, anthemic hard rocking tunes are this bands forte. However, when in a mellow mood (or with your girl), I would have to say that even the mellow tracks on this album are good in and of themselves. Hard rockin' tunes such as the killer opener, Long Way Home, the Aerosmith like (Pump era) Girl Crazy, Follow Your Heart, and Love Machine are great example of the catchy, good times hard rock that Blue Tears do so well. Again, fans of the band can buy this album and rest assured that they will find a lot to like here. Again, there are sixteen tracks on this album, the same as Dancin' on the Backstreets. 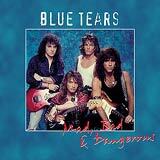 Even though this first volume of Blue Tears material is ballad heavy, there are still plenty of good, hard rocking cuts to quench your thirst. If you're like me, and prefer the hard rockin' side of Blue Tears, Dancin' On The Backstreets will be the better of this two album set for you to start with. Of course, if you like both of these albums that are put together with unreleased tracks from the Blue Tears vault, you've got to hunt down the band's 1990 self titled debut album if you don't already have it. Of course, be sure to look for the brand new studio album, The Innocent Ones in April, 2006.